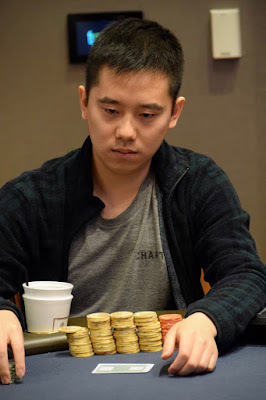 Ping Liu opens for 45,000, Ziran Xiao moves all in for about 400,000, action folds to David Larson who moves all in quite emphatically for about 550,000 and Liu finds it easy to fold. Xiao shows Pocket_Sevens and Larson has the Bigg Dogg, Pocket_Aces. The aces hold and Xiao is eliminated in 11th place, a $22,706 cash. Larson moves to 1 million.